Let’s examine two of the most influential billionaires of our times, Warren Buffett and George Soros. One squanders opportunities to promote and enhance the system that made both of them rich, while the other actively seeks to destroy it. In the case of Warren Buffett, when the infamous “Oracle from Omaha” speaks, people listen (just like E.F. Hutton!). The only problem is, what they listen to hurts our economy: some economically illiterate member of Congress hears Buffett (or Soros) talk, feels it makes some amount of superficial sense (or can be construed into supporting some new government program) and says “What works for Buffett (Soros) works for me. We’re done here!” Indeed, Barack Obama continues to site Buffett’s easily-mischaracterized anecdote of his secretary paying more in taxes than he does. I think the most important factor in getting out of the recession actually is just the regenerative capacity of– of American capitalism. I thought maybe– maybe they [the Fed] ought to charge them [the banks] a quarter of a percent to leave their money on deposit and that would really push it out. (Laughter.) But– but I mean, we’ve used up a lot of bullets. And we talk about stimulus. But the truth is, we’re running a– federal deficit that’s nine percent of GDP. That is stimulative as all get out. I mean, that is more stimulative than any policy we’ve followed since World War II. And, of course, World War II, we had a huge stimulus and it– it took us out of– a depression. But we are– it doesn’t depend on calling it the ‘Stimulus Bill’ to be stimulating. I mean, if– if– if the government is spending $3 for every $2 it takes in, that is– that is fiscal stimulus. And it isn’t kick-starting things as much as the American public would like. I’m sure as much as the Administration or Congress would like. It’s probably had some effect, probably less than the economists thought it would have going into this. That’s probably true, if the “economists” he has in mind are Robert Reich, Paul Krugman, and other modern-day purveyors of that discredited theory from Lord Keynes. Ironically, these and other comments were made surrounding Goldman’s Sachs’ “10,000 Small Businesses” graduation (a firm from which Mr. Buffett profited handsomely as an appropriately private investor, proving that attractive investment opportunities will find financing). Where Quick gives The Oracle room to opine on just about anything, nowhere does he launch into the litany of reasons why small (and large) businesses are being stymied by our current government, something this author forewarned of nearly a year ago. But what truly gets this writer’s blood boiling is Buffett’s yearning for the higher tax rates of a prior generation, and saying that our country’s prosperity was no worse for the wear. This is a common theme for Buffett, as demonstrated on June 27, 2007, November 15, 2007 and September 10, 2009, just for starters. Nevermind how much better things could have been then had taxes been lower. Nevermind the “malaise” we found ourselves in at the end of the period he reminisces. Nevermind the explosion of tax revenue that resulted from Reagan’s tax cuts. Nevermind that the stock market rally that they helped fuel helped to make Buffett who he is today. 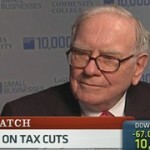 Buffett seems either genuinely embarrassed by the wealth he’s accumulated, oblivious to the reality of the Laffer Curve and how lower taxes on upper income earners would free up capital for investment, clueless that government could instead attack the expense side of the deficit equation, or all of the above. Again, all harmless, if it weren’t for his role as the statists’ financial Pied Piper. …sentiment has turned very sour in the last three or four or five months. It’s been generally sour on Congress and Washington, but it seems to have taken a turn for the worse. I — I hope we get over it pretty soon, because it’s — it’s not productive. George and I have something in common: In the early 1990’s, we were both trading currencies. The difference is, I didn’t have a balance sheet gigantic enough to take on the Bank of England, betting that central control would never be able to overcome the forces of the free market. Such forces wanted to make the Pound drop dramatically versus other currencies, and Soros knew it. Soros positioned himself for the inevitable and it yielded him a billion dollars in profits. Overnight, he became a celebrity in the hedge fund world. So it is the height of irony that the man who foresaw the failure of price fixing, the man who experienced Nazi and Soviet rule firsthand, would now be pouring hundreds of millions of dollars into organizations that seek to dramatically grow the influence of government in our lives. You’ve heard of the obvious ones: MoveOn.org, Center For American Progress, the Democracy Alliance, all chronicled by DiscoverTheNetworks.org and elsewhere. But how about Soros’ $50 million dollar check last fall, funding an effort to “purge economics of its free market zeal”? 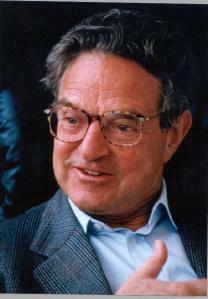 Just over the last several weeks, Soros has helped launch a website seeking to discredit the Tea Party. What a great example of that great World War II pilot saying: “When you start taking flak, you know you’re over the target.” As Stanley Fish writes, it’s an effort that may very well backfire, badly. Clearly, the “height of irony”‘s twin tower is the stream of people complaining to Fish that the Tea Party is being funded by the rich, while they rally (literally) around organizations funded by Mr. Soros. Now that is truly rich. ok, i work for a living, and i’m not particularly happy with what i get in terms of pay or benefits. at the same time apparently the wealthy are enjoying a great year. the reason for this is that there exists NO MARKET FORCE which would lead to higher wages for workers. i have a college education so it’s not like i’m totally unqualified, but the belief that the market is going to offer me what i want i know is nonsense. and more government certainly means more freedom for me. things like ADA and the FMLA act have expanded the rights of workers. i am a huge fan of the health care bill since it bans denying people coverage based on pre-existing conditions and as someone who has them that sure benefits me. i’m sure it doesn’t benefit the richy-rich shareholders or insurance execs, but why should i care? the expense side of the problem? listen, we’re cutting funds into education and all other sort of things we need to survive while we apparently are afraid to increase taxes on some wealthy people (whose low tax rates so far haven’t prevented economic meltdowns.) we’ve hacked and slashed at government spending (except military) and all i hear are lectures on why we should decrease it further. i wonder how many of you people who write/read this stuff have ever had to work for a living on minimum wage. LOL. Buffett resides in Grand Cayman so he does not get taxed at regular U.S. rates. Of course, his secretary pays more in taxes. As for Soros and the anti-tea party rhetoric, it’s nonsense. The man is profiting over many of the deals that are being made because of the current policies that are destroying our economy, i.e. oil drilling moving to Brazil, etc. These guys are world-class hypocrites. I agree – Buffet’s expertise doesn’t mean he has special insight in the organization of societies, tax rate effects, etc. I think it is irresponsible / conceited of such people (Hollywood celebs come to mind as well) to push their view, on subjects on which they have no special knowledge, because their celebrity gives them a very disproportionate influence. Buffett is a stock picker, not an economist — which is obvious given his abysmal ignorance of economics. But then certain malignant dwarves have won the Nobel Prize and yet make equally ignorant pronouncements about economics. Crony capitalists can’t thrive in free markets. Too bad they are such a force in the US today.